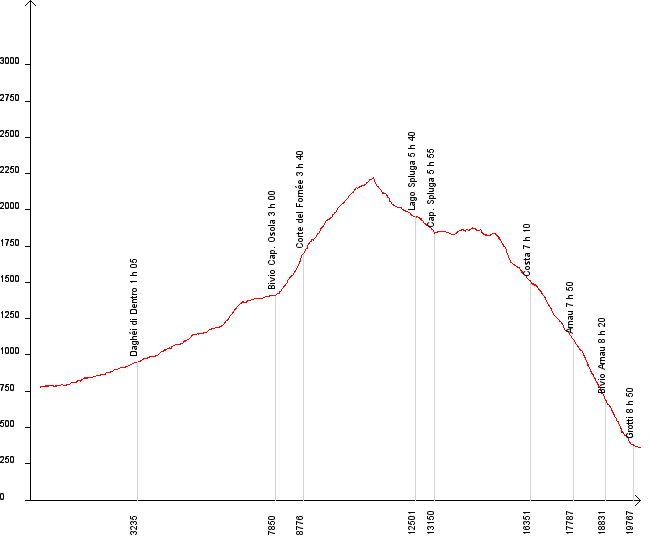 This is another crossing from Valle Verzasca to Maggia and because it starts and ends at a relatively low altitude it's probably the one requiring most effort (1470m of altitude difference going up and 1870m going down), so you might want to split it into a 2-day hike. You have two options for that: spending the night at Capanna Osola (3 hours from Brione) or on the side of Valle Maggia at Capanna Spluga (6 hours from Brione). The first section of the hike (Brione - Capanna Osola) is a relaxing walk along the river, the first half you walk on a paved road, then you go mostly through the forest. Once you reach Alpe Osola the path becomes steep but you're rewarded with constant awesome views of the surrounding peaks. The climb ends at Btta Canova where you cross over to Val di Giumaglio. After a steep descent you come to Lago Splunga which is a short distance away from the path and then to Alpe di Splunga where you can spend the night at the mountain hut Splunga. From here you have two choices: you can take the shorter way down (by 30min) which crosses Cortone, or the longer but more exciting path that follows the ridge with breathtaking views of Someo, Giumaglio and a large section of Valle Maggia, all some 1700m below you. The way down is very steep but gives you constant beautiful views down and across the valley.